The UAE President His Highness Sheikh Khalifa bin Zayed Al Nahyan has declared 2018 as the "Year of Zayed" in the country. 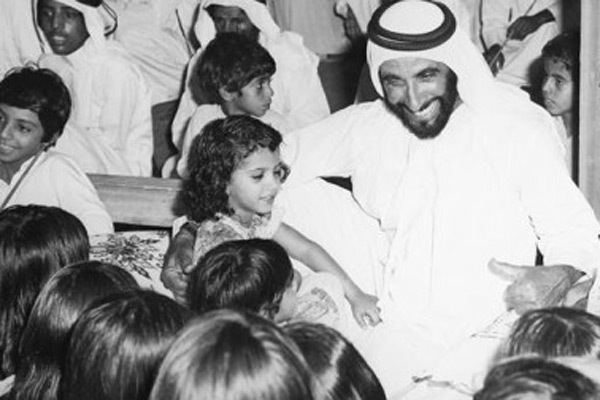 2018 marks 100 years since the birth of the late founding father of the UAE, Sheikh Zayed bin Sultan Al Nahyan, and the announcement was made on the anniversary of the late Sheikh Zayed's Accession Day - the day he assumed leadership in Abu Dhabi (August 6, 1966), marking the start of a new epoch in the history of UAE, said a Wam news agency report. The ‘Year of Zayed’ will highlight the role of the late leader in establishing the UAE Federation, and his local, regional and international achievements. The ‘Year of Zayed’ will seek to achieve several objectives, including being a time to highlight the role of the late Sheikh Zayed bin Sultan Al Nahyan in establishing the UAE and consolidating its foundations of modern development, with an emphasis on the nation's local, regional and global achievements, and continue to form the basis of this country’s progress. The Year of Zayed will seek to share Sheikh Zayed's values and principles, as well as one of the greatest world leaders, with an inspirational wisdom, vision and patience. This celebration will strengthen Sheikh Zayed's stature as a symbol of patriotism and love for the nation. The Year will be an opportunity to portray Sheikh Zayed’s legacy in forthcoming projects and initiatives that express his vision and values. Sheikh Khalifa said that setting 2018 as the Year of Zayed reflects the unique standing that the late leader holds with every Emirati as the founding leader of the union. With his wisdom and goodness, Sheikh Zayed set the foundations of modern development across all sectors in the UAE. His generosity is experienced not only in the UAE and the Gulf region, but also throughout the Arab world and internationally, with contributions and initiatives that continue to reflect his unerring skill as a modern leader, who gained the respect of so many people around world. President Sheikh Khalifa said: "On this day, August 6th, a new era dawned upon us all when the late Sheikh Zayed assumed command of the Abu Dhabi government, and began the march towards unity, prosperity and societal development." President Sheikh Khalifa pointed out that the late Sheikh Zayed was able to lay down solid foundations for a strong, united nation that balanced the requirements for modernity while preserving the cultural and social heritage of the UAE. This effective model has been a source of inspiration for countries seeking progress. President Sheikh Khalifa said, "The Year of Zayed is a great national occasion when we will proudly share memories of the life of the founding father, Sheikh Zayed bin Sultan Al Nahyan, and his gift to us of deeply-rooted values, principles and traditions that have become part of our Emirati identity." He added that this is especially true since the Union that Sheikh Zayed established with his brothers, the Rulers of the UAE, was based on unity and solidarity to build a progressive society that benefits everyone, and in which people live in security and stability. The President called upon all the nation's people to uphold the noble values instilled in them by the late Sheikh Zayed, including those of wisdom, respect, determination, loyalty, a sense of belonging to the nation, and a willingness to make sacrifices at whatever cost. Accordingly, the Vice President, Prime Minister and Ruler of Dubai, His Highness Sheikh Mohammed bin Rashid Al Maktoum, in response to the President's directives and to achieve the year’s goals, called for the launch of a comprehensive framework to develop an integrated and consolidated agenda that activates initiatives within all federal and local institutions. Sheikh Mohammed said: "We celebrate the centennial anniversary of the birth of one of the greatest and most noble men who dedicated his life for the present and future of the nation."